ASA’s California Weekly Roundup is your way to stay on top of medical cannabis news, events, action alerts, court support, and more. California lawmakers want to tax medical cannabis like a vice. What does that mean? What can you do? Let’s talk tonight. Log onto Google+ or YouTube a little before 8:00 PM tonight. There are only 14 days left until the California Citizen Lobby Day. Get registered today so that we can make appointments for you at you Assembly and Senate offices! If medical cannabis is important to you, register today for the California Citizen Lobby Day on May 23rd. ASA will make appointments for you at your Assembly and Senate offices when you sign up. Why does it matter? I am going to be talking a lot more about that in a live Google Hangout entitled “Medicine for Real” at 8:00 PM PT on Monday, May 9. Log into Google+ a little before 8:00 PM on Monday to join the interactive broadcast, or watch live on YouTube. The Department of Justice (DOJ) has dropped its civil forfeiture action against Harborside Health Center in Oakland, CA. The case was brought by the DOJ back in 2011 as part of a federal crackdown against legal state medical cannabis dispensaries. The dropping of the case was at least in part the result of a Congressional amendment which prevents the DOJ from interfering with those abiding by their state medical cannabis law. This marks the second time in recent weeks that the feds have dropped a case as a result of the Congressional amendment. In April, the DOJ dropped their appeal against the Marin Alliance for Medical Marijuana (MAMM). In that case, Judge Charles Breyer ruled in October, 2015 that the Rohrabacher-Farr Amendment, which Congress first approved in 2014, prevented the feds from proceeding unless they could demonstrate there was a violation of state law. Without any evidence of the state law violation (and also not wanting to risk losing a precedent setting case), the feds ultimately dropped their appeal of the October ruling. There are only 21 days left until the California Citizen Lobby Day in Sacramento. Get registered today! Announced a new partnership with a prestigious law firm to provide free legal support to medical cannabis patients. Worked with local officials in several cities to improve or adopt local medical cannabis licensing ordinances. Started scheduling appointments for California Citizen Lobby Day participants at Assembly and Senate offices. ASA will support a new “cottage license” for small-scale medical cannabis cultivators and oppose a DUID bill in the Assembly Committee on Appropriations (see below). On April 28th, the Epilepsy Foundation sent a group letter signed by patient organizations, including Americans for Safe Access, to the Drug Enforcement Agency (DEA) asking them to remove the federal barriers to cannabis research, and to remove it from its current schedule one status. The letter was initiated in response to the DEA’s announcement that it would make a determination, based on the Food and Drug Administration’s (FDA) recommendation, on the scheduling of cannabis in the first half of 2016. The letter from the three agencies was in response to a 2015 letter they received from seven US Senators, including two of the original sponsors of the CARERS Act, Senators Cory Booker, and Kirsten Gillibrand. A new partnership has emerged between Orrick, Herrington & Sutcliffe LLP, a global legal powerhouse based in San Francisco and Americans for Safe Access. Orrick will now be contributing, pro bono, its services to our Patients’ Rights Project, thanks to the work of ASA’s Board Member Bianca Green. For more than 14 years, ASA’s Patients’ Rights Project has supported patients navigating the legal system, and it has helped tens of thousands of patients in areas such as employment discrimination, access to health care, housing, and parental rights. This new partnership will enable us to expand and improve our services, which are particularly important to low-income patients. With access to legal medical cannabis expanding nationwide, more and more patients will find themselves in need of legal support as they try to navigate these complex laws and regulations. Every law is unique and patients often find it challenging to understand the specifics of the laws, which leaves them vulnerable to arrest, prosecution, and incarceration. There are only 29 days left until the California Citizen Lobby Day in Sacramento. Get registered today! Testified in opposition to SB 987 (McGuire), which will impose an extra 15% tax on medical cannabis statewide. Testified in opposition to AB 2243 (Wood), which will impose a tax of $9.25/ounce on medical cannabis cultivation. Worked with local advocates to promote a new medical cannabis-licensing ordinance in Los Angeles. ASA will be working with local advocates in the San Francisco Bay Area and elsewhere to promote and improve medical cannabis licensing ordinances. 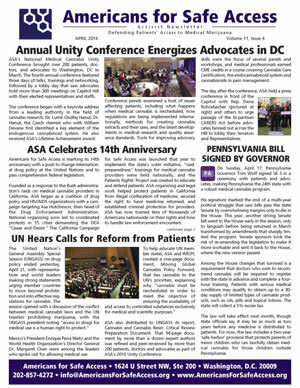 Take a look at ASA's special anniversary Activist Newsletter. In it you'll find out about the latest on what happened at the big UN drug policy meetings, the new law in Pennsylvania and important Senate action on medical cannabis, not to mention the 2016 Unity Conference, modifications to three state laws, and ASA's 14th anniversary. In honor of ASA's birthday this week, you can take advantage of a special half-price registration offer for Unity 2017! I am in New York this week to take part at the United Nations General Assembly Special Session (UNGASS) where leaders from all over the world are joining together to discuss global drug policies, including what to do about medical Cannabis. This historic meeting will produce important ramifications for national and international medical Cannabis policy. I am here with members of the International Medical Cannabis Patients Coalition (IMCPC), and we are meeting with UN officials in order to help in the effort of making UNGASS 2016 the starting point for the change in the scheduling status of Cannabis.